Being a parent is tough. Maneuvering a busy street with a stroller is hard enough; travelling with a double stroller can be near impossible. Bulky double strollers cause traffic jams on city sidewalks when wheels get caught on a crack. Drastic movement and shaking on gravel jostles sleeping kids awake. Attempted family hikes turn into nightmare scenes, full of shrieking children and a stroller firmly refusing to move. 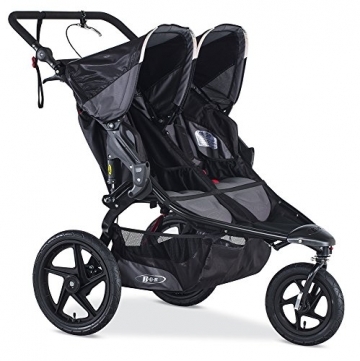 For the active, busy parent with 2+ kids in tow, an all-terrain double stroller is a great option to minimize conflict. We get that parents, especially those with two or more squirming kids, just don’t have the time to sit down and thoughtfully research the best double strollers. 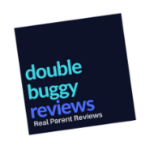 We’ve gone through and looked through multiple double strollers to tailor the best reviews and offer you only the best double strollers to look at. 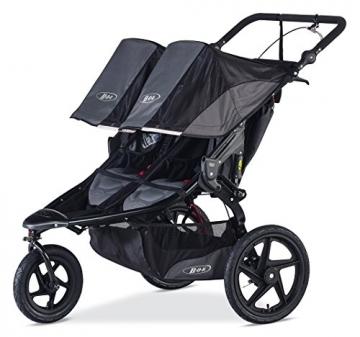 During our research, the BOB 2016 Revolution PRO/FLEX Duallie Stroller quickly made its way onto our list. 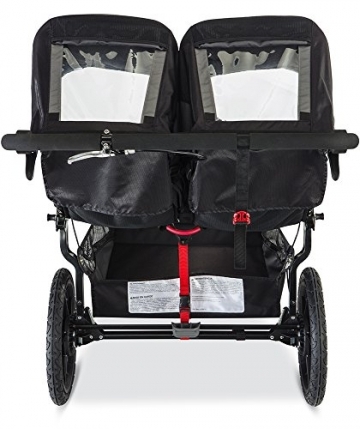 We’ve carefully tailored a thorough BOB 2016 Revolution PRO/FLEX Duallie Stroller Review; sit back, glance through, and see if this all-terrain double stroller is a good option for your busy family. 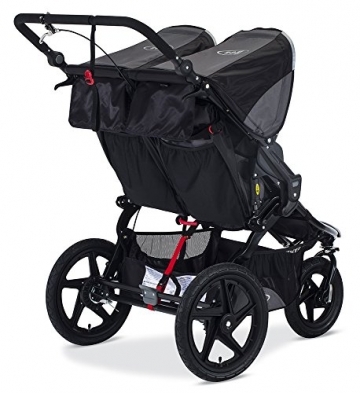 This side-by-side all-terrain stroller comes in black, red, canyon orange, or lagoon blue. 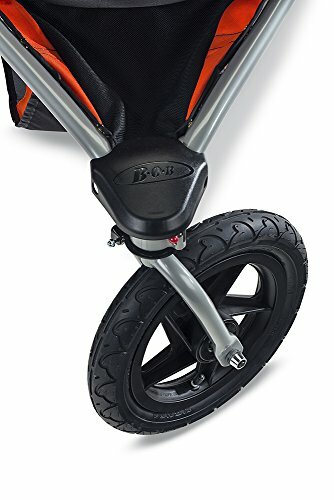 The stroller is built around a uniquely stable and strong suspension system, offering one of the smoothest rides we could find. The handlebar can slide through nine different positions for driver comfort. The seats can be easily adjusted to a reclined or sitting-up position. 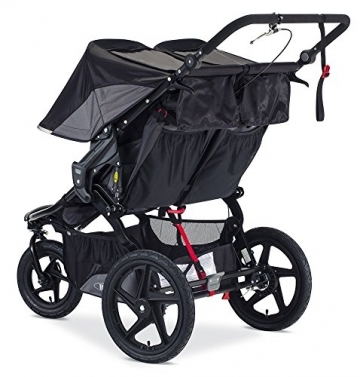 The stroller has a singular front wheel which can lock or swivel, allowing for easy maneuvering or for consistent and easy forward motion, making this stroller great for jogging. Between the suspension system, strong all-terrain wheels, and the adjustable seat angle, the BOB 2016 Revolution PRO/FLEX Duallie Stroller Review is a great option for active families who want to take the less-beaten path. Lots of small benefits and features added up to make this stroller into a great option for any family. The seats easily slid from recline to upright and vice versa with a simple button, rather than the intricate and confusing adjustable straps of other strollers. The incredible versatility and balance afforded by the suspension system allowed us to steer with a single hand, even if only one kid was in the stroller. The canopy has four different positions (fully extended, half-extended with a peek-a-boo window, half-extended without the window, and closed) that offered a range of options depending on where the sun was hitting or how the weather was to best protect our kids. 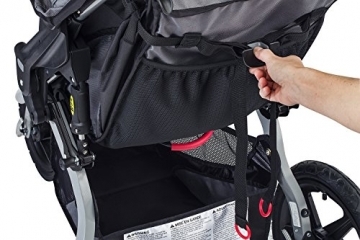 The storage basket is low enough to be accessed by the sides of the stroller, but not a hassle to reach into. All of these features built up to provide an incredible all-terrain experience. 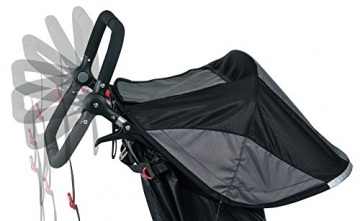 This stroller is 48 inches by 30.5 inches by 43 inches and weighs a light 33.1 pounds. The stroller can handle up to 75 pounds of weight on it. 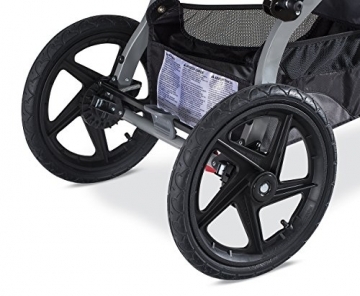 The wheels are made with high-impact polymer to absorb shocks and minimize stroller shaking and bumping. Adjustment possibilities were plentiful. The handlebar could be moved through nine distinct heights and positions; the seats could be lifted to almost upright or reclined for easy napping. 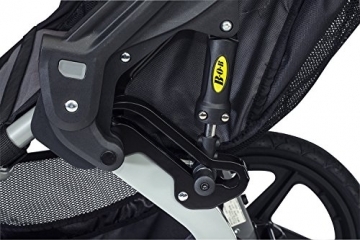 The lockable suspension wheel allowed for easy transition between tight maneuvering and consistent forward motion. The stroller was light, and the two-step fold mechanism was easy enough to complete repeatedly. Movement was incredibly stable and smooth thanks to the intricate suspension system and the all-terrain tires, which minimize jostling from bumps or uneven surfaces. The padded seats were incredibly comfortable for our kids, and the adjustable handlebar kept the driver feeling comfortable. The suspension kept the ride smooth and let sleeping kids stay sleeping. The adjustment of the seats from recline to upright is easy as the touch of a button (literally). The canopy slid into four different positions, allowing for utmost comfort and sun protection. Hand-activated breaks made it easy to stop movement quickly and reliably, even during jogging or going downhill. Single front wheel allows for extensive maneuverability. The folding mechanism wasn’t impossible, but definitely took some work to master. The seats are a bit shallow, so larger children may be a bit more uncomfortable. The BOB 2016 Revolution PRO/FLEX Duallie Stroller is a fantastic choice for easily woken and fussy children. The suspension system keeps the ride reliably smooth, even on bumpy sidewalks or trails. The all-terrain tires took on trails, beaches, and boardwalks with ease. It’s a great fit for active families and urbanites alike. 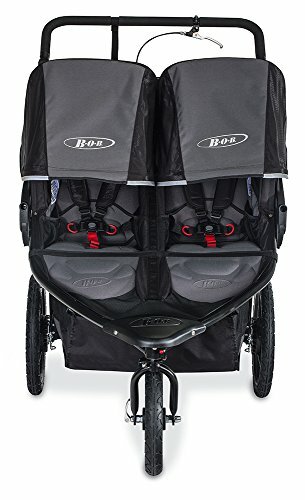 If you’ve read through this BOB 2016 Revolution PRO/FLEX Duallie Stroller Review and decided to look further into purchasing, more information can be found here.